Y’all familiar with Pilgrim’s Pride Chicken? Big producers in east Texas and west Arkansas and Louisana. Lots of chicken farms…between these guys and Tyson there aren’t many independents left…but that’s another story. Pilgrim’s Pride runs very odd commercials featuring Bo Pilgrim…the owner or such…in a Pilgrim’s hat and touting his chicken over his competetors “Fat yellow chicken”. He’s also known for unusual and perhaps illegal influence peddling, and outright bribery of state legislators. Apparently, he takes himself quite seriously. So, Bo, my man…are you hopelessly conceited what? I mean really, where does one go to get a massive 30-foot fiberglass likeness of yourself anyway? Bo Pligrim...the really big head. 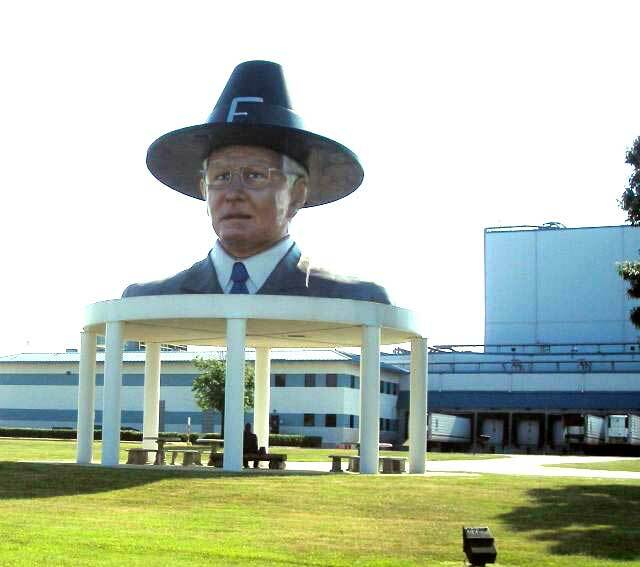 This monstrosity is outside a processing plant here in the great state of Texas…I’m ashamed to admit. I mean…really…what in the world are they thinking? Corporate icon or overbearing nutcase. You decide. One Response to Good gravy! … and is this any worse than an owner who brags on his TV ads that he feeds his chickens marigold petals so that they have that “healthy golden color”?